What if you truly knew how powerful you were? Well, get ready -because in this powerful book, a team of teachers -are going to inspire you to find that out! 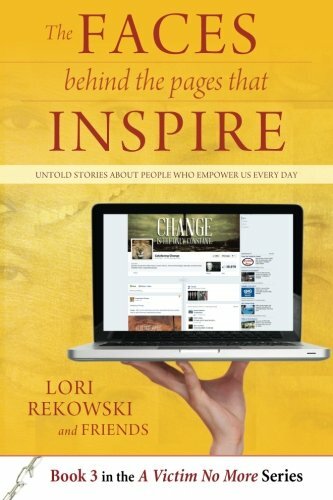 In this second volume of The Faces Behind the Pages that Inspire, Lori Rekowski is taking the message about leaving the victim mindset behind, one-step further. For this particular edition of the A Victim No More series, she carefully chose Facebook fan page administrators that have plunged forward, with a level of faith in humanity that frankly is sparse, at best, these days. Not afraid to call out the perpetrators, some of these Admins are social media warriors for the underdog. You will read the tragedy to triumph stories behind some of the most proactive page administrators on Facebook today. You may want to grab you box of tissues &#x2014;as you will be taken to the depths of despair and back up to the triumph&#x2019;s reflective of these Admins daily lives, that Rekowski now calls her &#x201c;heroes.&#x201d; You'll discover: Why victim hood was never your destiny; What causes your anger; and That it's not the emotion of anger that creates change &#x2014;it's your own conviction under it; And, be taught that happiness, health and prosperity are your birthright. (Hint, you only forgot) When you are finished reading these touching and inspiring stories: you will realize that there comes a time when self-reflection only goes so far. You will know what path you need to take to go to the next level &#x2014;for you to evolve and fully step into your power. When you are ready? Social responsibility and advocacy then becomes your ticket to finding your way fully back home. Back home to a world where your reality, favors abundance for all and a peaceful state to reside in. Ready to join us? Join Daniel Gottwald, Shawne Duperon, Karleigh Strickfaden, Richard Crawford, Valerie R. Sheppard,Michele Peterson, Chris Castillo, Chantelle Ashworth, Sherryl Frauenglass, Justin Nutt, Sally Fisher, REv. Sandy Schwartz, Jennifer Brocasto, Vivek Subramaniam, Sue Krebs, Gabriella Boaehmer, Jim Camut, Zdravko Stefanovic, Gigi Galluzzo, Mauricio Ramos, Jenny G. Perry, Lisa Villa Prosen, Bernard Alvarez, Annee Nyambura Mwangi, Lisa K. Fox, Bex GibbonsLori Palm &amp; Wes Hamilton, Cristina Lorga, Agape Satori, Jennifer Hough, Heather Richardson, Michael Perlin, Dena Patton, Rebecca Gross Menashe, Vicki Reece, and Sharon Lund; in a series that will change your heart forever. Lori Rekowski is the visionary behind the A Victim No More, powerful series of books. She is also the founder of A Course in Courage Victory Tour. A published author, a professional speaker, an advocate for many nonprofit organizations and causes, and is a loving mother and grandmother. She has been a successful business entrepreneur and consultant for more than twenty-five years. She takes great pride in celebrating her healing process with others, and believes passionately in the ability of anyone to overcome victimization. In fact, she considers it her life purpose and passion.